Today’s a hard day. We lost our 13 yr old pup – Pumpkin – yesterday. She’d been losing weight steadily for the last month. It was obvious when I came home from San Francisco that something was wrong, painfully obvious when the DH and I got home from Hawaii. We had her in and out at the vet’s, tried different things, but in the end, knew anything we were contemplating doing to prolong her life was for us and not her. She was in liver failure, the doctor suspected it was also cancer. Very hard decision to let her go, but we know it was for the best. These are two of my favorite pictures of her, when she was younger and full of energy. And man, did that dog have energy! 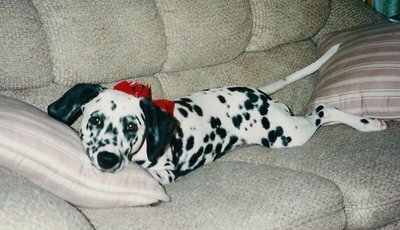 I have memories of letting her in the backyard and just seeing a blur of black and white as she ran back and forth. I’m going to miss her unique personality. I’m heading off to try and work. Not sure how much I’ll get done today.